Here is a list of the cuts that our butcher does for us. The French name links to the cut on the la-viande site and the English name links to Wikipedia. 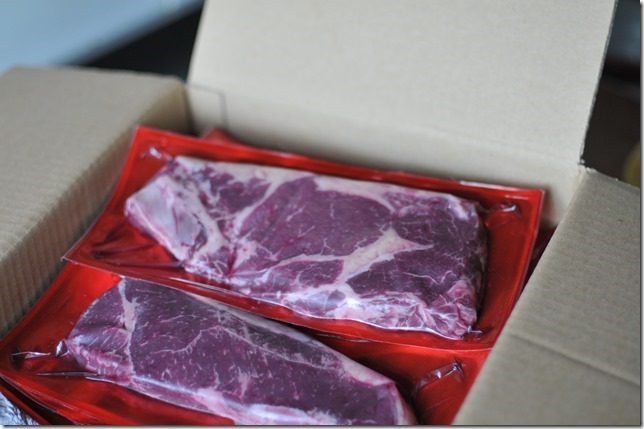 Filet – Fillet, tender, juicy, expensive. 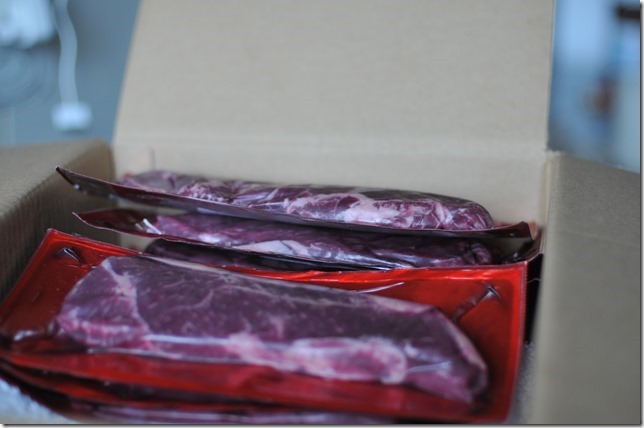 Faux-Filet – Sirloin steak with a different name in each English-speaking country. The photo below show a faux-filet, although the hand model is an 8-year-old which messes up the scale a bit. Entrecôte – Fore rib steak. We’ve made fore rib roasts out of this in the past. My personal favourite steak. Gite/Noix and Rond de Gite – this is a tricky one as it seems the Rond de Gite is part Topside and part Thick Flank, and the Gite à la Noix is Thick Flank. In the USA we just make it easy and call it all Round. Tranche Grasse – a rump steak but a hard one to track down. See number 8 in these butcher photos. There are six muscles in the Tranche and they have distinct names in French. 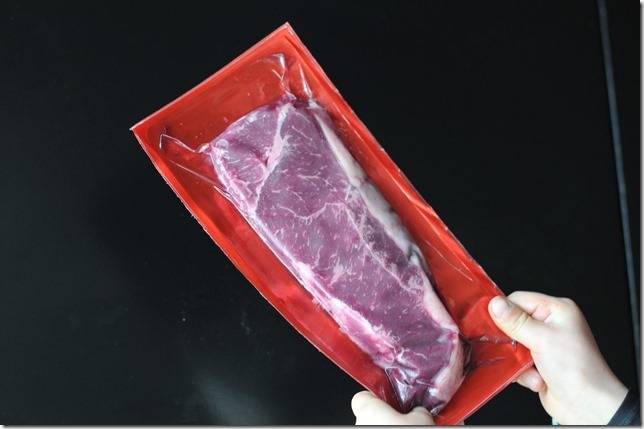 Osseline and Onglet – Hanger steak, although we received just one packet of Onglet from this cow and it is sitting in my fridge right now. Paleron and Macreuse – Thick rib (or brisket). Braise this. Pot au feu – More thick rib/brisket for braising. Plat de Côte – More thick rib/brisket. All rich with beefy goodness! Hi- thanks for this! I’m an American in France. The beef cuts have never made any sense to me here. Now I know what to look for when my American recipe calls for a rump steak or chuck steak! I’m Canadian, and again, this makes good sense… although they could learn the art of hanging beef eh? Also, prime rib, although very hard to find is: cotes couverte a la noix. I once spent 60 euros on a chuck roast that tasted like dairy cow at Grand Frais. It looked like prime but clearly wasn’t. What is French for Topside? Hello Marcus, Jenny’s comment above says “tende de tranche” and looking at this Australian site a Topside does look very much like a tende de tranche. I need to update my page. My favorite cut of meat is Tri-tip. Readily available on the west coast of USA but hard to find in some States. Is there a French equivalent? Try the Aiguillette Baronne. After working with my butcher we think we figured it out, I sell it as a roast. Persillé means “marbled”. You used a cut that had plenty of marbling. It could have been chuck (basse cote) but could have been something else, Hope that helps. Hey Mickey. Chuck would be close to Basse Cote. The cuts usually aren’t exactly the same but Basse Cote is the cut from the front of the rib area which uses the same muscles as chuck. So, since most french beef has very little marbling, would using basse cote in my stew be an acceptable substitute? Honestly basse cote is a really nice cut for stew and expensive. There are other cheaper cuts that are marbled but they will be less tender. If you ask for a cut that is persillé for a stew you can get cheaper cuts. The pot au feu cuts are less tender and will take longer cooking to get all soft but that’s what the French usually use for stews rather than basse cote. You’ll also get a lot of variation between cattle breeds and age of cow. Where I live they use retired Blonde cows at the butcher and this makes stew cooking take ages.